I believe that knowledge about the brain (aka neurosciences) is radically changing the way we create UX. It gives us a great opportunity to challenge the status quo and build truly innovative and efficient UX. Not all methods to create a strong user experience are efficient. Worse still, some are quite the contrary ! Allow me to explain using an analysis of number representation by Denis Guedj (a professor in science history and epistemology at the university Paris VIII-http://en.wikipedia.org/wiki/Denis_Guedj). The problem with this method is that for each number that is higher than the previous one, you need to add a new sign. That means that the number of basic signs increases in function of new needs. 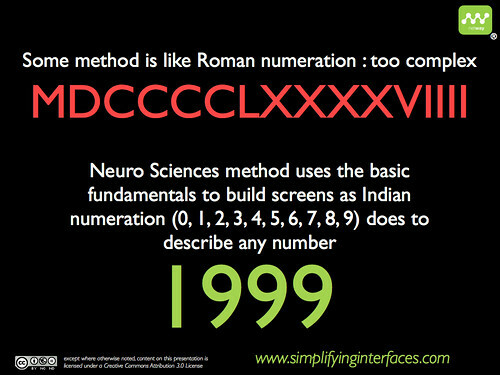 The Indian numeration, which is the basis of our system, allows doing everything using very little. With only ten numbers, from 0 to 9, you can represent any possible number you want. This method, which was finalised in the 16th and 17th century by Indian astronomers and mathematicians, is still valid today and has never been challenged by any other method. Usability is a set of techniques that evolve empirically, like Roman numeration. Usability mainly uses the rules of common sense applied to objects. What is extraordinary is to see how many usability guidelines lists exist that contradict one another. Usability, like Roman numeration, leaves us with an enormous field of possible subjective interpretations. 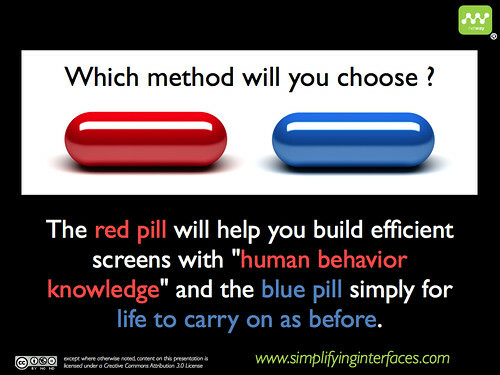 Behavioural science however is based on the fundamentals of the perceptive and cognitive system of the human brain. If you know these fundamentals, you can answer all possible interaction cases without having to rewrite new rules every time you encounter a new problem. It’s like using the numbers from 0 to 9. What does evolve over time is not the set of rules, but the fundamentals themselves. I think I was taught what you call “indian” numeration to be “arabic”. AFAIK, it’s the arabs who came up with “our” current numeration. Actually MIM would do. 1000 – 1 + 1000.